Introducing the magnificent canine called the Presa Canario! Also known as a Perro de Presa Canario, Dogo Canario, or Canary Mastiff, this purebred is a physically large and powerful dog with a confident, commanding presence. This is not your typical gentle family dog. But, it is loved and respected as a dependable working or guard dog. Are you interested in this breed but unsure if it’s the right canine for you? Read on to learn everything you need to know about the Presa. 1. It is the animal symbol of the island of Gran Canaria. 2. The Canary Dog is part of the Molosser family. 3. This breed is popular because of its low-shedding qualities. 4. The Canario Mastiff is highly confident. 5. It has a bite force of 540 PSI. 6. The Presa Canario’s average lifespan is 8 to 12 Years. 7. They need a ton of exercise. 8. A Presa Canario puppy can cost up to $2000. The Perro de Presa Canario: what’s good About ‘em? The history of the Perro de Presa Canario is carefully recorded, evoking mystique and awe for the breed. The Presa Canario’s history dates back to the 15th century when it was first brought to the Canary Islands by the Spanish conquistadors. Muscular, fearless and attentive, this dog was bred for work. Farmers on the islands were continually dealing with packs of feral dogs that would attack their livestock. The Presa was the answer and became the ultimate protector. Unfortunately, it was also used for dog fighting due to its Mastiff strength and clutching genes, which are said to be inherited from Alano, a type of Bulldog ancestor. In the mid-1940s, fighting was outlawed and the Perro de Presa Canario was regulated to official breeders for the preservation of the species. With careful breeding, the Presa Canario made a glorious comeback in the 1970s, distinguishing itself as a loyal working dog. Molosser dogs are noted for their large size and brawn. The Presa is the epitome of this, with a thick body and a broad, square head that is one of its defining characteristics. When a Presa Canario is full grown, it can reach an impressive height of 26 inches (66 cm) and weigh up to 100 lbs (45 kg). A Presa Canario with cropped ears is tradition, so the ears won’t interfere while the dog is working with cattle. The Presa’s paws resemble that of a feline, and their movement is described as cat-like. This is also a distinguishing feature of the breed. If you’re looking for a dog that won’t disperse fur all over your house, the Perro de Presa Canario has the coat of your dreams! Short hair and no undercoat means low shedding and easy grooming for the Presa Canario. Weekly brushings are recommended to keep that luxurious coat healthy and shiny. 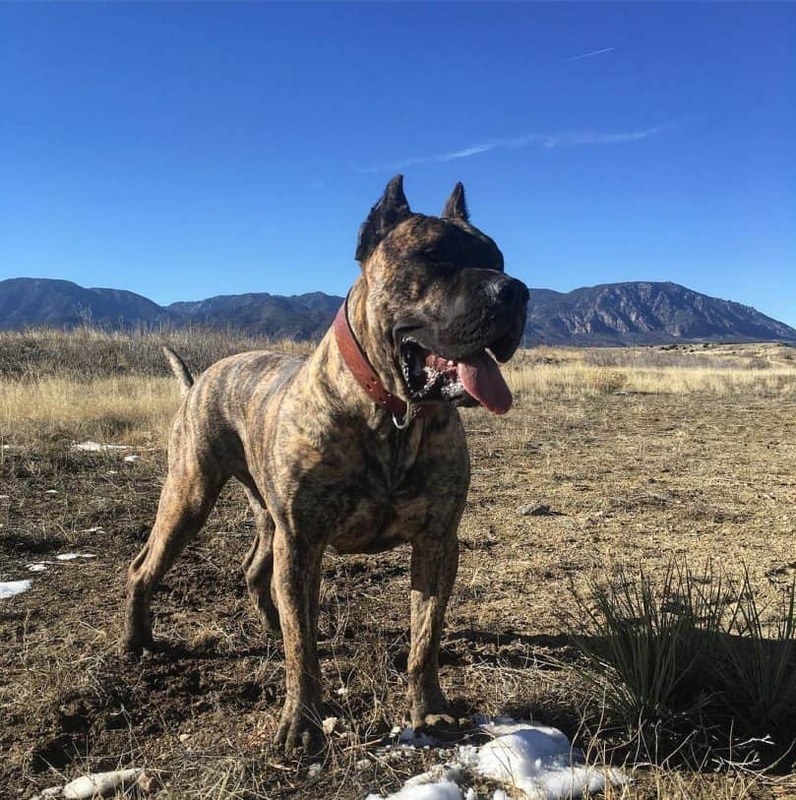 Presa Canario colors are of great importance pertaining to the breed standard. Fawn or brindle is accepted, as well as only 20% of white coloring on the chest, feet and muzzle. A full black coat is a hot debate, with the AKC-FSS, UKC and UPPCC accepting it, but not the FCI. A black face mask that doesn’t pass the eyes is necessary for a Presa Canario to be considered purebred. The Perro de Presa Canario is a breed with working instincts. It is naturally dominant with the potential to assert aggression. After all, it was originally used to attack wild dogs and defend livestock. Because of this, Presa Canario training should involve early socialization and obedience. With an experienced dog owner at the helm, it can grow to be an exceptionally behaved pet that is intelligent, loyal, and confident. The Canary Mastiff will be docile towards family members – especially her master. But, be wary about leaving her around other dogs, strangers or small children. The dominating alpha nature tends to kick in! You cannot be uncomfortable around this dog and must demonstrate that you are the boss. That is why we do not recommend this breed for first-time dog owners. That’s one heck of a bite! But, how does this compare to other powerhouse Molosser breeds? The Alano Espanol has much in common with the Presa. Both have roots in Spain. The Alano was used for hunting wild boar and to bait bulls in the.ring. These dangerous jobs allude to the breed’s physical strength and prowess during a fight. Even though it is said to be one of the breeds that contributed to the genes of the Presa, its bite force isn’t as strong at 227 PSI. I could not find an exact PSI listed for the Boerboel, but it is known to have a powerful bite force. After all, this massive breed was once used in South Africa to protect livestock from hyenas and lions. With a similar working background and size, it’s safe to say that it could be a close draw between the Boerboel and the Perro de Presa Canario. The Kangal is the king of dog chompers, with a jaw-dropping 743 PSI. This ancient Molosser was bred to withstand extreme climates and protect livestock from wolves and bears. An impeccable guard dog, the Kangal will definitely give the Presa a run for its money, especially with a potential weight of 143 lbs (65 kg) and height of 33 inches (85 cm)! This is one tough pooch that you don’t want to mess with. Highly intelligent and packed with power, the Italian Cane Corso has the Presa beat with a 700 PSI. It’s one of the strongest dogs in the canine world, renowned for its massive size and hunting and guarding skills. Like the Presa, this Mastiff type needs special training to ensure it grows to be docile and calm as an adult. It harbors an aggressive streak, especially towards other dogs and strangers. Take a closer look at the Presa Canario attack mode. The Canary Dog is indeed a hardy specimen when it comes to working life and endurance, but the Presa Canario’s health is susceptible to serious genetic diseases that can greatly impair them or shorten their lifespan. These are the most prominent Presa Canario health issues to be aware of. Hip Dysplasia: A hip joint deformity that impairs mobility and can lead to lameness. Dilated Cardiomyopathy: A type of heart disease that results in weakened blood pumping and contractions. Mast-Cell Tumors: These can be cancerous. Patellar Luxation: An abnormality that causes the kneecap to become dislocated. Osteochondrodysplasias: Developmental disorders that affect the skeletal system, for example, dwarfism. The Canary Mastiff is used to working outdoors and undertaking strenuous physical activity. Therefore, you can expect your Presa to be a bundle of energy. Taking her for a long walk or jog every day is enough to keep her trim. If she doesn’t get the exercise she needs, the Presa can become bored and destructive, chewing your prized possessions. Consider getting your Presa Canario jumping at dog competitions. They love having a job to do! This breed is known to excel at competitions that test agility, obedience, and strength. It’s another good option to keep her physically and mentally stimulated. With the Canary Mastiff’s size and the amount of activity it needs, we do not recommend this breed for apartment living. It needs space to run and stretch out its long limbs. A house with a fenced yard is the best environment for the Presa. The Presa Canario’s diet needs balance to keep diseases and obesity at bay. Talk to your vet to determine how much food you should give your dog per day, according to its age. Divide the food into 2 to 3 meals. High-quality dry dog food with protein and carbohydrates will ensure that your Presa is getting plenty of nutrition. This ancient breed is expensive, but for good reason. Molosser dogs are a complicated bunch, mainly because of their size, temperament, and guard dog instinct. Their reputation as a dangerous dog is also something to consider, as they are blacklisted in several US cities. It takes a special (and highly responsible) dog owner to dedicate time and energy to a Perro de Presa Canario puppy. Yes, it is a big, beautiful dog that turns heads, but if this is the only reason why you want one, take some time to do your research before making a decision. 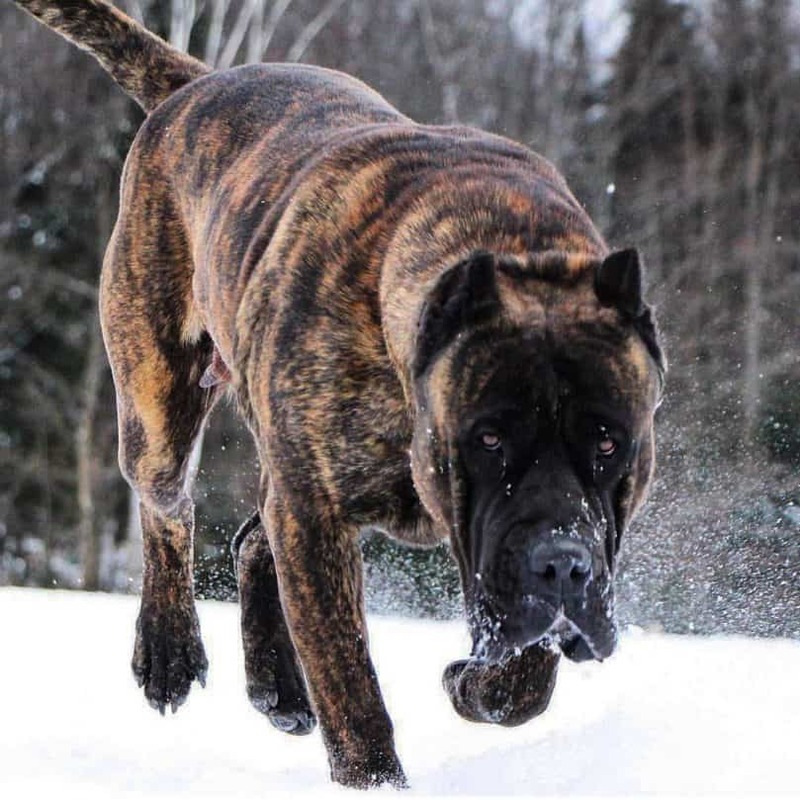 If you are passionate about this breed, then searching for reputable Presa Canario breeders will ensure you get a puppy with the best genetic traits possible. 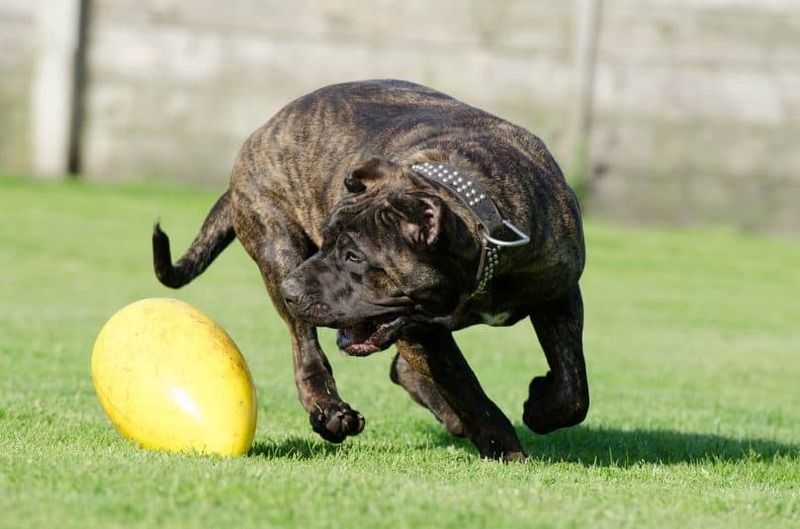 It’s important to stick to breed standard regulations, because a puppy that comes from a puppy mill where the genetic makeup is skewed and Presa Canario bloodlines are unknown results in a higher risk for disease and unpredictable temperament. 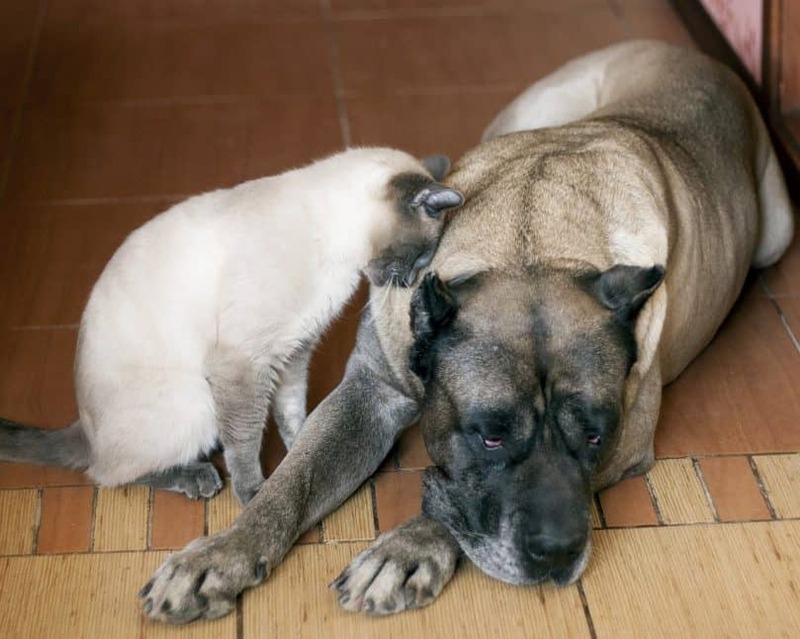 Follow these tips when looking for Canary Mastiff breeders. Visit the premises where breeding takes place. The breeder should be open to this! Come prepared with questions regarding how the puppies were raised and the breeder’s experience. Ask to see the parent dogs, if possible. This is highly important! Looking at the health charts of a puppy’s family tree can give vital insight into future health and behavior. Ask the breeder about vaccinations, deworming and medical clearances. Look for customer testimonials – these are transparent indicators that show whether a breeder is legitimate or not. When people buy a dog based on looks and fail to consider the time and responsibility that goes into nurturing a breed such as the Presa, it is not uncommon to find them at rescues. Consider saving the life of a rescue Presa! Check out these well-known rescues. Towering over other dogs with a dignified air and awe-inspiring physique, the Presa is no doubt a beast. But, that doesn’t mean it’s the best match for just any dog owner. An experienced master that is passionate about this breed and has an in-depth understanding of Presa Canario characteristics is recommended. This dog needs ample socialization and training from the time it is a puppy to grow into a well-balanced dog. With correct rearing, a Presa is loyal, confident, fearless, and protective. This breed is highly protective of its family, but it can be unpredictable around other dogs, strangers, and even children. A Presa Canario that has not been trained correctly can be prone to aggression and alpha behavior. As a working dog and guardian, it has a dominating instinct that arises if the owner is not confident and assertive. Keep in mind that this breed is large in size and high energy. It requires daily exercise and a home with plenty of space. An apartment is not recommended for this dog.